"Another solitaire variant you might appreciate"
Do you like to play solitaire card games? 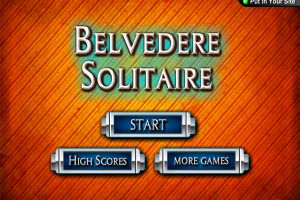 You might have gotten tired of playing the one standard provided with your Windows box and as such be interested in the alternative presented here, called Belvedere Solitaire. Elsewhere on Winportal you can find a wide range of similar solitaire game alternatives belonging to the cards category, but this one is a freeware one which might look similar to the one called La Belle Lucie, the latter of course also available on Winportal. Belvedere Solitaire differs from La Belle Lucie in that it will let you tableau piles and foundations regardless of suits. Furthermore, it also has a higher winning rate. Without entering into the details of this classic card game variant, those among you familiar with patience annex solitaire games might enjoy this one right away. So, if interested in this freeware game, hit the download button now.